WASHINGTON, DC, November 9, 2015 (ENS) – New York City, the City of Tampa, Florida, and the State of Wyoming will receive a total of $42 million from the federal government for pilot projects demonstrating next-generation connected vehicle technology. U.S. Transportation Secretary Anthony Foxx says equipping vehicles to share information and communicate with each other and their surroundings in real time will cut the unimpaired vehicle crash rate by 80 percent while reducing congestion and greenhouse gas emissions. As part of the Department of Transportation national Connected Vehicle Pilot deployment program, the three locations were selected in a competitive process. New York City will install Vehicle to Vehicle (V2V) technology in some 10,000 city-owned cars, buses, and limousines that frequently travel in midtown Manhattan, as well as Vehicle to Infrastructure (V2I) technology throughout the midtown area. This includes upgrading traffic signals with V2I technology along avenues between 14th Street and 66th Street in Manhattan and throughout Brooklyn. Roadside units will be equipped with connected vehicle technology along the FDR Drive between 50th Street and 90th Street. U.S. DOT made an additional commitment by awarding $17 million to solve peak rush hour congestion in downtown Tampa and to protect the city’s pedestrians by equipping their smartphones with the same connected technology being put into the vehicles. Tampa committed to measuring the environmental benefits of using this technology. In Wyoming, a largely rural state, the focus is on the efficient, safe movement of freight carried in commercial heavy-duty vehicles through the I-80 east-west corridor. Between 11,000 to 16,000 vehicles travel this corridor every day, and by using V2V and V2I, Wyoming DOT will collect information and disseminate it to vehicles not equipped with the new technologies. These connected vehicles will yield unprecedented levels of data that will be the basis for a multitude of innovative applications that will lead to smart vehicles, smart infrastructure, and ultimately smart cities. Research has found that the technology could reduce unimpaired vehicle crashes by 80 percent, while also reducing the 4.8 billion hours that Americans spend in traffic annually. In 2012, the USDOT tested and proved connected vehicles’ life-saving potential in the largest real-world pilot of the technology to date, with over 2,700 equipped vehicles operating on the streets of Ann Arbor, Michigan, a university town. Participating vehicles used V2V safety technology to help drivers avoid crashes. Safety apps warned drivers of braking vehicles ahead, vehicles in their blind spots, or impending red-light violations. These tests proved that connected vehicle technology works in a variety of vehicle types: cars, trucks, transit vehicles, motorcycles and bicycles. With the Connected Vehicle Pilot Deployment Program, the U.S. DOT is now focusing on accelerating the deployment of the technology in more regions throughout the nation. The U.S. DOT’s goals for the program are straightforward – advance deployment, measure impact, and uncover and address the technical and non-technical barriers to deployment. In addition, the Department announced in May a proposed rulemaking that will require the installation of V2V communications equipment in all new vehicles. The proposal is expected by the end of 2015. 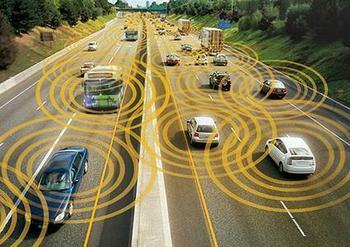 New cars with connected vehicle technology could be in showrooms as early as 2016.